In just a few short days, the larger than life BPI Sports booth will be ready to rock-and-roll for this year’s Olympia expo in Las Vegas, Nevada. The BPI booth is never short of excitement, and this year is no different! 2015 brought the launch of several brand new products for BPI, nearly all of which Olympia attendees will be able to sample by stopping by booth #518. Stop by the BPI Sports booth, #518 and meet 4x Mr. Olympia, Jay Cutler who will be signing autographs and taking pictures with fans. The lovely BPI Bombshells will also be there to meet-and-greet and help you find the perfect BPI supplements for your goals. To top it off, BPI Sports will be giving away a YEAR’S SUPPLY of protein! All you have to do is sign up by entering your name and email at any of the iPad stands at the booth. Another huge draw to this year’s BPI Sports booth will be the exclusive apparel available for purchase to Olympia attendees. Get your hands on some awesome BPI branded t-shirts, tank tops, hoodies, and hats while supplies last at the booth! Also, for every BPI Sports or Cutler Nutrition product sold, customers will receive a FREE t-shirt with purchase! PUMP HD™: A pre-training and performance fuel designed to amplify your athletic performance and help you train HARDER! BEST CREATINE™: A maximum strength creatine formula combining 6 advanced forms of creatine for enhanced muscle building and strength gains without the bloating and loading of most creatine formulas. BURN XS™: A premium thermogenic that enhances weight loss, focus, and mental clarity all in one single capsule. 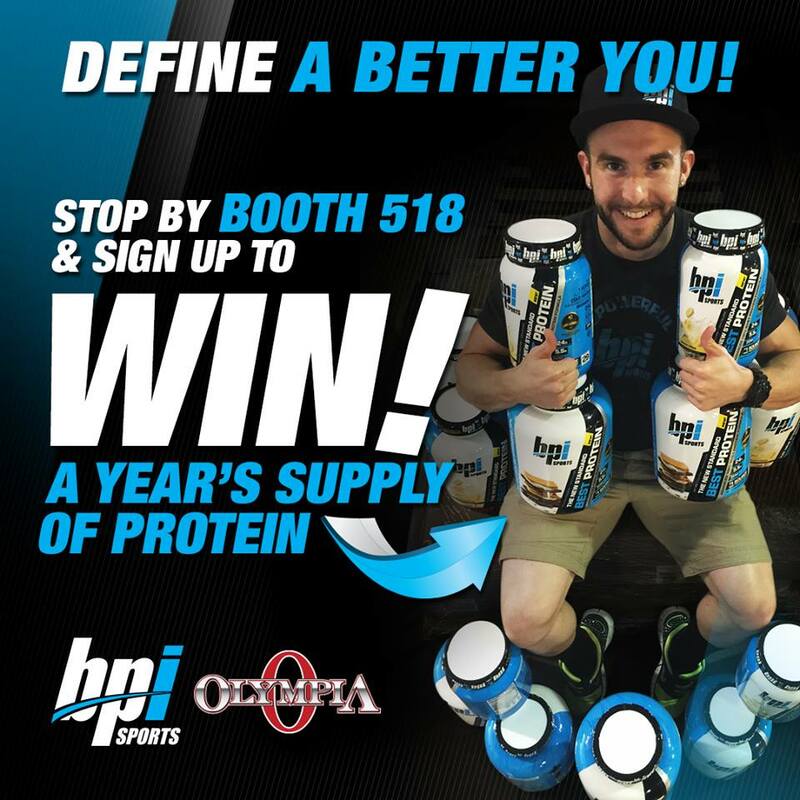 We’ll see you there at BPI Sports Booth #518, Las Vegas Convention Center!